Meet Your New Volunteer Platform! Find service opportunities and log your volunteer hours. Looking to connect with our community partners, find volunteer opportunities, or log your completed hours? You're in luck! 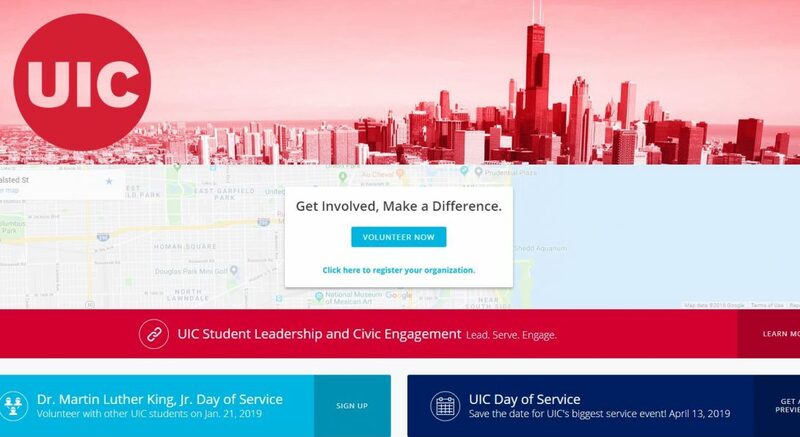 UIC just launched its new volunteer platform for students. Visit service.uic.edu for your one-stop shop of all things service! Create a public profile, build your volunteer resume, and show how active UIC Flames are in the community. Already completed volunteer hours? No worries - follow the steps below to log your past participation! Log on to service.uic.edu using your netID and password. Click the "Add Hours" button located in the top menu bar. Enter “Hour Type”: click “yes” if you are entering hours from an opportunity listed on the site, and click “no” if you are adding hours from an outside opportunity. Add remaining information and click "Submit Hour Entry". Students who log 100 or more hours between July 1, 2018-June 30, 2019 are eligible to receive the President's Volunteer Service Award and will be recognized in the Chancellor's Student Service and Leadership Awards Ceremony.